Come Id and Salman Khan’s fans become anxious about what his new film will be all about. 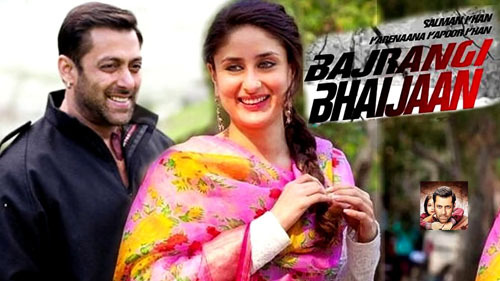 But with Bajrangi Bhaijaan, the guesswork had stopped long back as the teasers gave a fair idea of its storyline. Kabir Khan has taken a simple concept and created a blockbuster out of it. With a star cast of Salman Khan, Nawazuddin Siddiqui, Kareena Kapoor Khan, Harshaali Malhotra, there is little that can go wrong with this dramatic tale. The film produced by Salman Khan himself in association with Rockline Venkatesh, hit the theatres on 17th Jul 2015. The film revolves around Shahida (Harshaali Malhotra) a six year old mute girl from Pakistan, who gets lost in India after getting off the train. Shahida meets Pawan Kumar Chaturvedi (Slaman Khan), who is clean hearted simpleton and a staunch devotee of Lord Hanuman. Pawan meets Rasika (Kareena Kapoor) Delhi, where he brings Shahida to stay with him. After making numerous failed attampts to help Shahida reunite with her family across the border, Pawan takes it upon himself to complete the task. That is when he meets Chand Nawab (Nawazuddin Siddiqqui), a small-time TV reporter from Pakistani, who decides to help him. How Salman attains his objective is what forms the rest of the story. Director Kabitr Khan has done a tremendous job of depicting the notion the possibility of peace between Indian and Pakistan through exemplary citizens. The highlight of the movie is its portrayal of simplest politics without focusing too deeply on its dark interiors. Slaman has given superb performance as has his leading lady Kareena Kapoor. But the actual stars of the movie are definitely Nawazuddin Sidiqqui and Harshaali Malhotra, both of whom have delivered a truly mesmerizing performance. Overall, the movie is a complete entertainer with a deep message and IndiaCafe24 gives Bajrangi Bhaijaan a rating of 4 stars.